International Account Planning. King‘s road or den of thieves? In the beginning, there was the ethnocentric strategy which consisted in expanding the national marketing to foreign countries (export marketing). The characteristics of the foreign markets were thereby neglected in favour of a strong focus on the country of origin. This means in terms of advertising that campaigns which were successful in the country of origin were simply transferred to the host country. The polycentric strategy can be put on a level with nationally differentiated marketing. It is aimed to satisfy the conditions of the host country with own advertising campaigns. This is similar with the regiocentric strategy: it is based on the identification of a group of markets whose consumers react similar to the same marketing measures. 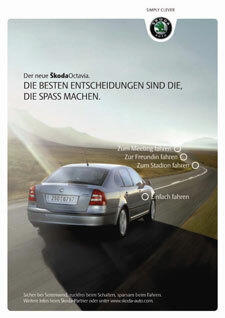 One example for this is the so called euro-marketing. The geocentric strategy finally focuses on gaining competitive advantages on the world market by globally establishing the whole production process of the company’s goods and services by using geographical advantages. In order to save costs, it is tried to reach consumers of all countries with one single advertising campaign. The foreign marketing is thus not only linked to the expansion of advertising to other countries but also to the question whether it can be carried out standardised on an international level. At the same time, these strategies outline the area of conflict international automotive marketing is exposed to. It lies between the necessity of adaptation to market needs on the one hand and the compulsion to reduce costs through standardisation on the other hand. Mid of the 80ies, the convergence thesis of the marketing researcher Theodore Levitt triggered the tendency in favour of standardisation. He assumed that consumers worldwide increasingly resembled each other in their requirements, especially in view of the willingness to forego customized products in favour of a more attractive price. He substantiated this with global mass communication, international travel and harmonisation of the educational systems. Accordingly, he predicted a worldwide demand for standardised mass products. The discussion, whether these products were also marketable in the same way soon concentrated on international advertising, because its standardisation was attributed to have a very high potential in cost reduction. At first glance, standardised international advertising means a uniform presentation of advertisements and TV commercials with regard to form and content. Only the linguistic conversion varies according to the different countries. Marketing experts call this approach program standardisation. Film 1: Standardised TV-commercial for 5 European countries. On the other hand, there is the so-called standardisation of processes. It consists in standard procedures when planning the advertisement. In the language of the advertisers it is also called “Account Planning“ or simply “Planning“. In the broader sense, standard processes not only comprise creation and realisation of advertising, but also efficiency review through market research as well as exchange of information resulting from these processes and management of the personnel involved. This applies, regardless whether advertising campaign itself is standardised or adapted. Today, recent results suggest that program standardisation has less influence on profitability than expected. Moreover, standardised advertising seems to be less effective than adapted advertising in view of internationally differing market and communication conditions. Strictly speaking, the advertising impact can only be evaluated, if the performance review, too, is effected according to comparable criteria. This example underlines that standard processes are a prerequisite for program standardisation. This is another reason why “account planning“ was brought to the fore in the discussion regarding standardisation. Particular attention is paid to the question, how high-quality account planning can be ensured on an international basis. The advertising objectives have to be derived from the overriding marketing and corporate objectives and have to be planned in the line with the corporate and environmental situation (Berndt et al. 2003, p87). Strategic account planning is thus planned on long term as far as it concerns a sustainable positioning in the perception of the consumer (Bednarczuk 1990, p12). 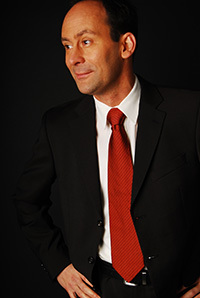 The term “uniqueness” implies that strategic account planning has to develop a specific positioning on the basis of competitor analyses. These tasks require a systematic collection of information in the company and its environment, which are relevant in respect of the definition of advertising objectives, anticipation of the advertising effect and control of the achievement of objectives (Sander 1993, p263). Process models represent procedures of account planning regarding these tasks (Beninde 2000, p57 ff. ; Rainey 1997, p1; Sander 1993, p269; Schweiger, Schattenecker 2001, p139). The models of international account planning are based on them (Berndt et al. 2003, p216; Clifton 1997, p145; Mooij 1991, p375). 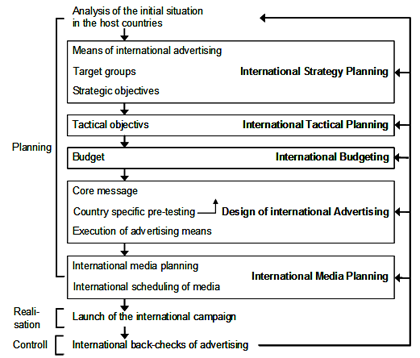 Figure 8: Process of international account planning (Source: Berndt et al. 2003, p216). The question, whether a globally uniform or a country-specific positioning is suitable can only be answered, if the procedures and results of account planning can be compared on an international basis and if the coordination between the parent company and its subsidiaries is possible. Standard processes consist in establishing comparability (Kreutzer 1986, p 9). Nevertheless, it can be stated that the factual extent of standard processes in the automotive industry is falls short of potentials. Against this background, the following concept of international account planning can be seen as a suggestion. The international cooperation in planning an advertising campaign which is realized in different countries is considered to be the condition for de-veloping strong brands and augurs at the same time cost cutting, as far as the same TV-commercials and advertisements can be used internationally. Looking at some automobile commercials that are celebrated throughout Europe, the international account planning seems to be the king’s road for creative campaigns. However, such a success is only possible, if the divi-sion of work on main issues is settled beforehand between the parent company and its foreign subsidiaries. Otherwise, organizational barriers and personnel conflicts impeding the cooperation and stifling any creativ-ity are predetermined.